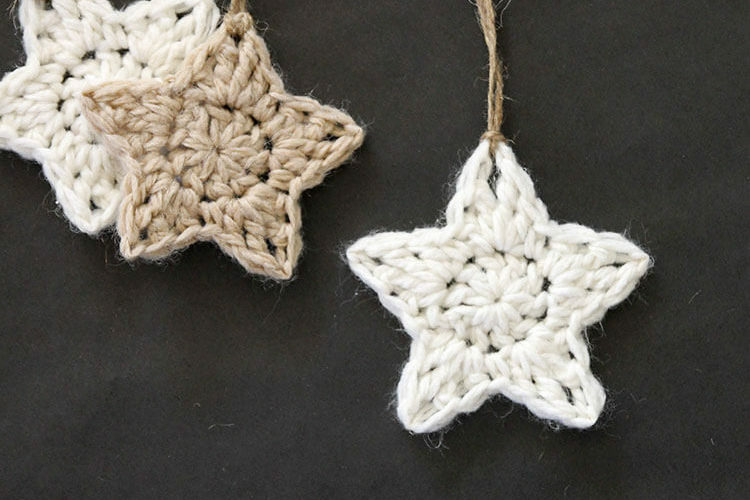 A big thanks to Floracraft for sponsoring this post! This post also includes affiliate links, and I may make a small commission if you decide to make a purchase. Thanks for supporting Persia Lou! Raise your hand if you know what you are going to be for Halloween this year! Anyone? 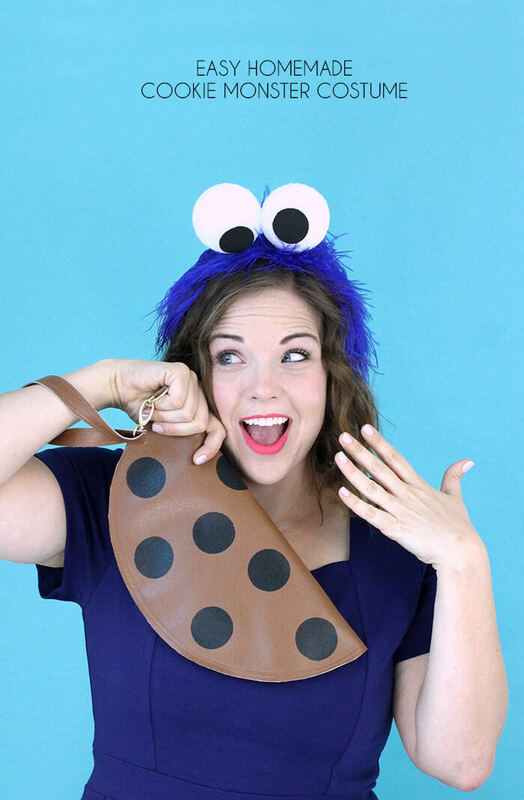 Our family is still in the negotiation stages, but I am excited I at least have a cute and easy option for myself with this Easy Homemade Cookie Monster Costume. In my ideal world, my whole family would do a big group costume, but my kids keep growing up and having opinions, which makes it harder to get a theme everyone agrees on. Dang kids! A couple’s costume like last last year’s Inspector Gadget and Penny costume is a good consolation prize, but I’m still holding out hope that I can convince my kids on the group costume. Wish me luck! 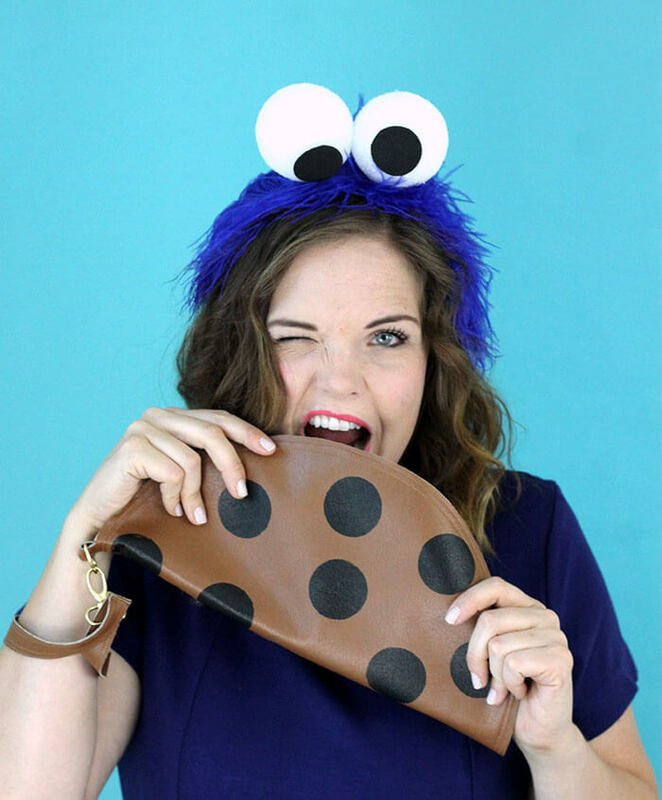 It immediately reminded me of the muppets, so I used it as my jumping off point to make a fun and really simple Cookie Monster costume because who doesn’t love Cookie Monster? What do you think? I like it, and the best part is it was so easy to throw together! I really like costumes that are made up of real clothes – you know, like stuff you would wear even if it weren’t your Halloween costume. 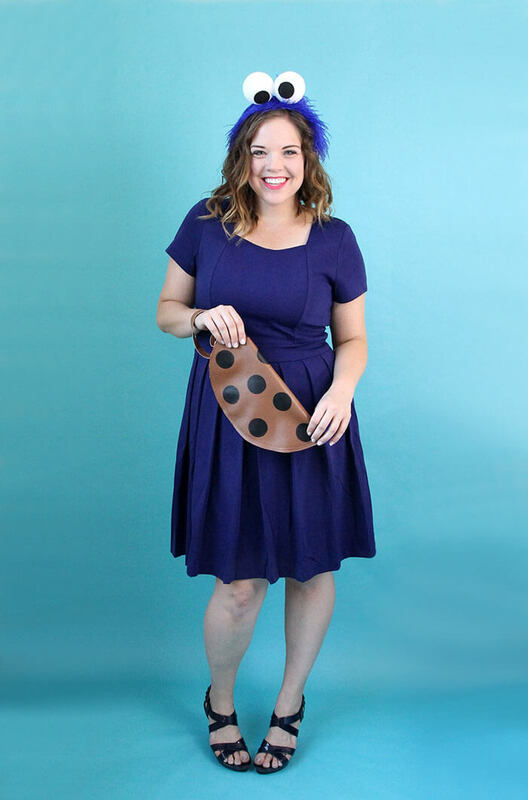 That’s what I love about this Easy Cookie Monster Costume – it’s just a blue dress and a couple easy DIY accessories! I got my dress here, but just find any blue dress (or skirt and skirt, or shorts and skirt, or tunic and leggings, or whatever) that you like! Now let’s make those accessories! Start by clipping off the bottom few inches of each ostrich feather to remove the stiffest part of the feather. 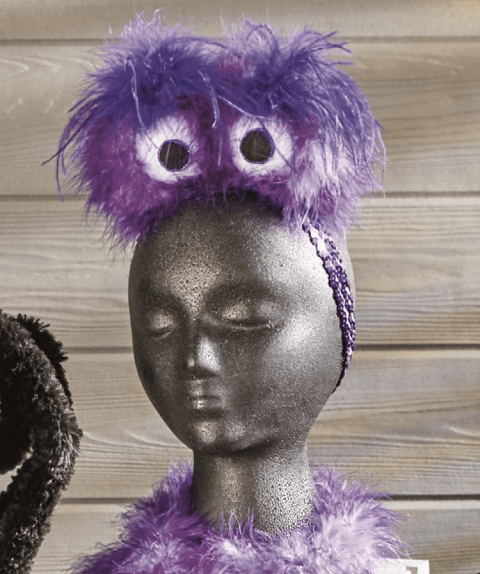 Then glue the ostrich feathers onto the headband so they overlap a bit in the center. Use the punch to cut circles from the craft foam (you could also use black felt and scissors). Glue the black circles onto the foam balls so they are a bit crooked like Cookie Monster’s pupils. Finally, glue the foam balls onto the top of the headband. That’s it! Cut two 13.5″ circles from the faux leather. Also cut two 3/4″ x 14″ strips and two 3/4″ x 3″ strips. Add your “chocolate chips” to one circle using the paint and foam pouncer. 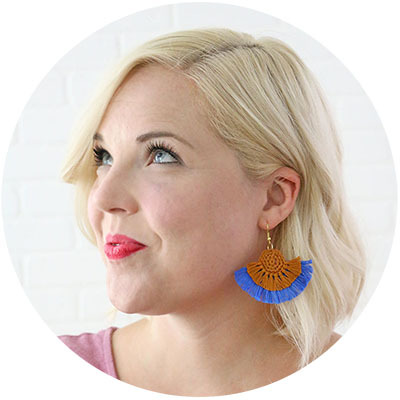 Cut a 1/4″ slit in the center of the other circle just slightly longer than the opening of your zipper. Sew the zipper into the slit. Sew the two 14″ strips together right sides facing out, and then thread the gold swivel clasp onto this double sided strip. Sew the two ends together to create a handle with the gold swivel clasp attached. Sew the two 3″ strips together with right sides facing out. Thread the D ring onto the strip. Pin the two circles together, right sides facing out. Fold the 3″ strip in half, with D ring threaded onto it. Pin between the two circles with D ring sticking out of circles and in line with the zipper. Sew the circles together around the outside edge of the circle. Clip the handle onto the D ring using the attached clasp. And that’s it! If you make your own cookie monster costume, I would love, love, LOVE to see it! Please share it to my facebook page or tag me on instagram! You can check out the other Make It Fun: Crafts Team’s Halloween projects below! 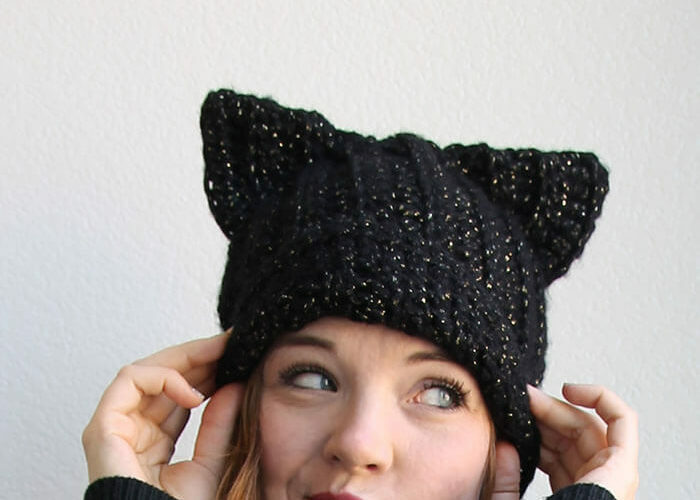 You are so dang cute, and so is this costume! So fun! Thank you! I love this costume! So so cute! and the pictures are adorable! Hey! I just noticed I am linked in this post. Thanks lady!! This just saved my “hiney”. Mine didn’t turn out as great but i got so many compliments on how simple and “genius” and cute this is. I used royal blue tissue paper and made it crumply like his fur around one of my kid’s old headbands. Used one white paper plate for the eyes (Sharpie for the pupils). And i actually re-used a brown paper whole goods bag to cut out a circle cookie – glue stick the handle on the inside and glue stick up the sides so it would close. Then i cut out little curcles from the leftover bag and Sharpied those for choco chips. The bag fit perfectly around my wrist all day. Thank you again!!!! Ah! Good job! Way to work with what you have! 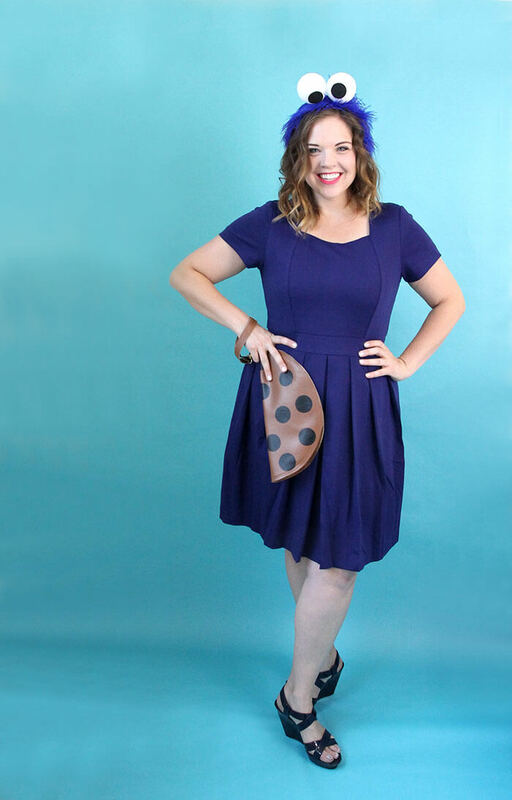 I love the idea of using a brown paper bag for the cookie purse. So smart!